In our last edition, we Pelican Migration Consultants focused on how to Work and Live in Canada. Now it is time to know more about the different ways in which a nurse can live and work in Canada or migrate to Canada as a nurse or study nursing in Canada. A licensed practical nurse or a registered nurse who like to migrate to Canada on a permanent residency is invited to explore the opportunities of Quebec skilled worker Immigration program or QSW. A nursing professional with an international nursing education credential or experience is allowed to work and live in Canada. The nursing professional can live as a temporary resident by obtaining a valid job offer letter from any of the registered Canadian employer. The chances to get a Canadian Permanent Residency increases while you work in Canada. Subsequently, the dream to get a Canadian Passport or the nationality will be materialized. What is Quebec Skilled Worker Immigration Program (QSW)? The province of Quebec with its rapid economic reforms, huge spending in the healthcare sector, wide job vacancies and high pay scale requires a large number of international nursing professionals to contribute to their economy. The province introduced a separate immigration program called Quebec Skilled Worker program to cater to the vast diaspora of nursing professionals all around the world. The QSW program allows internationally educated nursing professionals to be qualified to get the Canadian Permanent residency without a valid Canadian Job offer. The QSW program works on a point based system in which applicants are given points based on factors such as Age, Education, Work Experience as well as Language proficiency results. An applicant who meets the eligibility requirement of QSW is qualified to receive a Quebec Selection Certificate. It ultimately leads to obtaining the ultimate goal of Permanent residency. The points given for the French Language skills in the QSW program are marginally higher compared to other programs. But most nursing professionals will meet the eligibility criteria by receiving high points for factors like the area of training and education. What is Canadian Work Permit – Temporary Residency Visa? The economy of Canada has been bullish since the Trudeau the government has taken the charge. The country in the recent times requires more qualified international nursing professionals than ever due to its high spending on the healthcare sector. A qualified nursing professional can get the status of a temporary resident or work permit after obtaining a valid job offer from any Canadian Employer in Canada. In the first stage, the applicant with a nursing credential outside Canada must do an educational assessment of his/her credentials. In this educational credentials assessment, the Canadian government will compare the education received by the applicant with the Canadian educational standards. If the assessment is completed without the presence of the applicant inside Canada, then he/she is allowed to stay in their residing country throughout the assessment process. 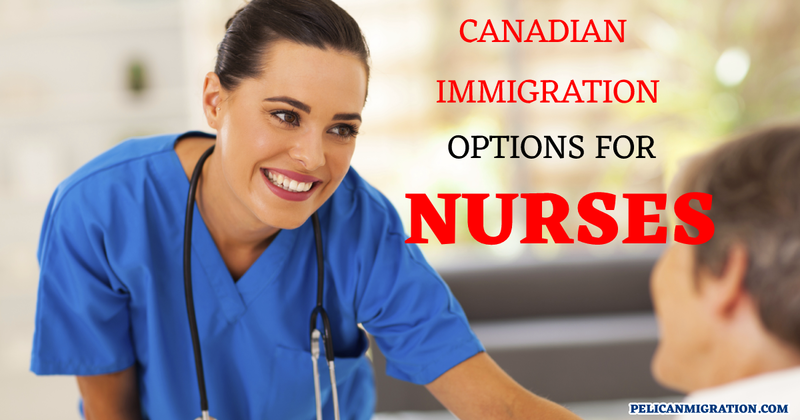 Once the assessment process completed, the applicants must register as a nurse in Canada. If the applicant has successfully registered as a nurse he/she should begin obtaining a valid job offer letter from the employer. The various provinces in Canada have various social initiatives to introduce highly skilled nursing professionals to various employment opportunities in the healthcare industry. During the period of working as a temporary resident, an applicant is eligible to apply for Canadian permanent residency. Apply for Canadian permanent residency through various immigration programs like Canadian Experience class and Provincial Nomination programs. How to Register as a Nurse in Canada? To qualify as a registered nurse in Canada, one must register either with Canadian Nursing Association or (CAN) or the Canadian Council for Practical Nurse Regulators (CCPNR). The Nursing registration requirements in Canada are managing by individual provinces and territories in Canada. The applicants who like to register with CAN or CCPNR should register first with the nursing regulatory body of the province or territory in which the applicant would like to live in. Applicants who wish to migrate to Canada through Skilled Worker visa should create an express entry profile. Create express entry profile once the educational assessment and English proficiency results have been achieved. There is a very high chance to get the Canadian PR to qualified nursing professionals if they apply through Canadian Express Entry Process. The country of Canada always renowned for its generous hospitality and warm relationship with its immigrants. If the applicant has proper credentials and good experience, getting a Canadian Permanent residency is a very easy process. Pelican Migration Consultants, help nurses from all around who look to migrate to Canada through one of the above-mentioned programs. At Pelican Migration Consultants, Our Regulated Canadian Immigration Consultants (RCIC) are members in good standing with the Immigration Consultants of Canada Regulatory Council (ICCRC). They have the right mix of experience and knowledge in guiding every applicant through the various stages of the immigration procedure. The fact that our RCIC agent office is based in Edmonton, Alberta. So that we are regularly updating or knowledgeable in regards to the recent changes in the Immigration Policies of Canada.